With the front seats removed you can get a good look at the rear seating options. The center console is the item in the center foreground of these pictures. For the rear seats you will have the choice of either two or three seats. Here is the two seat option. The seats are about 40mm higher than with the three seat option so they provide the occupants with a slightly better view. Just like the front seats, the rear seats can have their bases tilted between 12 degrees and level as well as slide back and forth 150mm and the seat backs also lean back. Obviously the rear cabin wall prevents them from leaning back a long way but they will still go back as much as an airline seat. The seat bases are 562mm or 22" wide and are therefore very roomy. The seats each have 4 pins that hold them to the seat mounts. These pins will be locking but with a quick release allowing you to remove the seats quite easily in case you want to transport some large items. The seat mounts will have just a few bolts holding them in place and will therefore be easily removable for creating a spacious area for cargo operations. 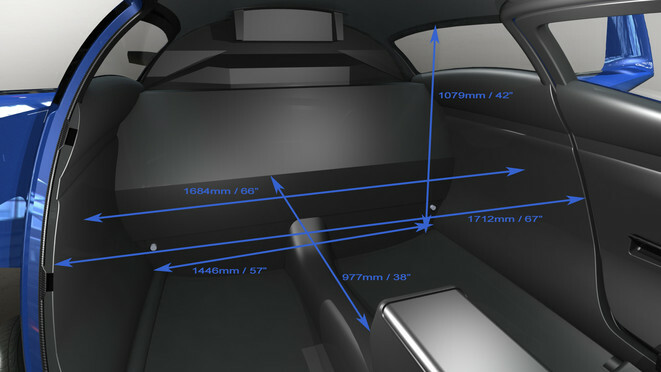 As you can see from these dimensions there is quite a decent amount of space available behind the front seats. Some quick math shows there is at the very minimum 57 cubic feet of storage space. The seat mounts for the 3 seat option are slightly different to the two seat option but still allow you to place items such as skis and snowboards under the seats with a maximum length from the rear wall to the heels of the pilot's feet of 1900mm or 74". These mounts will also be quickly removable with a handful of bolts holding them in place. The three seat option allows for 3 full size seats the same as the front ones only with a slightly narrower seat base. The total width of the seat bases is 1555mm or 61". The center seat base is 500mm or 20" wide. This is real luxury space when compared with the Cirrus 5 seat option at only about 45" wide. So whether you choose the 4 or 5 seat option your passengers will not feel at all cramped. As with the front seats, the seat bottom cushions will be held in place with velcro and can readily be removed to allow the front seats to lay completely flat. If desired, the seat cushions could be constructed completely flat and larger so they cover from wall to wall allowing for a bed with a length of 66". Of course you always have the option to configure it to your needs but the 2 or 3 seat option is what we will be providing. With the three seat option the lower half of the center seat back will fold down providing padded arm rests for both passengers as well as a tray area and cup holders. This configuration then gives you the convenience of 5 seats and additional amenities if you only have 4 on board.